This WorkSafeBC initiative is a first, with potentially a number of others to follow, and is a strategic effort to increase the pipeline of potential professionals interested in a rewarding career in the area of major emerging professional opportunities, not only with WorkSafeBC, but employers, insurance companies, unions and private rehabilitation providers across British Columbia, Canada and internationally. Recognized in the International Social Security Association’s Best Practice Guidelines on Return-to-Work as the gold standard in professional competence, CDMPs and CRTWCs now reflect a global professional community of over 4,000 individuals in 13 countries across all continents and expanding at a brisk pace with almost 700 across all Canadian provinces and territories. Videos are available for viewing on the IFDM 2018 website. They include opening and welcome videos by Master of Ceremonies Wayne Wouters; Federal Ministers Carla Qualtrough and Patricia Hajdu; Premier of BC John Horgan, and presentations by Yazmine Laroche, DM for Accessibility, Government of Canada; Dr Joachim Breuer, Director General, DGUV, Germany; Francois Perl, Director General, INAMI/RIZIV, Belgium; and the handover to Belgium for IFDM 2020. We are pleased to announce that Ms. Yazmine Laroche, Deputy Minister, Public Service Accessibility, Treasury Board of Canada Secretariat, will be the opening keynote speaker taking place on Monday, October 15, 9:00 am – 10:00 am. 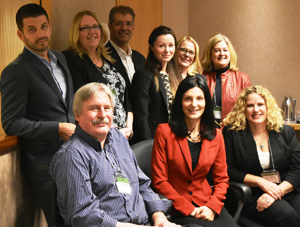 Ms. Laroche was appointed to this position by Canadian Prime Minister Justin Trudeau on August 7, 2018 with a mandate to lead the Government’s public service accessibility agenda. For further details, please see the attached Second Update. 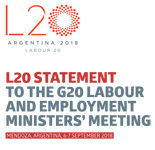 The G20 Labour and Employment Ministers’ Meeting, held in Mendoza, Argentina, Sept 6-7, 2018, released a Statement which identifies significant disability related objectives, starting on page 8, Article No.8, under the heading, “Promote Decent Work for persons with disabilities“. Dr. Joachim Breuer, member of the Board of Governors of Pacific Coast University for Workplace Health Sciences (PCU-WHS), who is CEO of the German Federal Workers Compensation System and President of the International Social Security Association (ISSA), a United Nations affiliated agency in Geneva, was one of the participants of the G20 meeting. 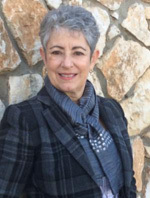 Dr. Breuer will also be delivering a keynote address during the opening morning session of the 9th International Forum on Disability Management – IFDM 2018 – taking place in Vancouver, Canada – October 15 – 17, 2018. 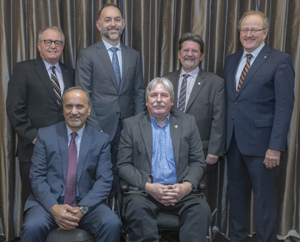 The Pacific Coast University for Workplace Health Sciences (PCU-WHS) was most pleased to host the Honourable Seamus O’Regan, Canada’s Federal Minister of Veterans Affairs and Associate Minister of National Defence at its campus today. 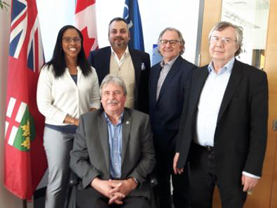 The Minister was very interested to learn more about the broader area of Return to Work / Disability Management, both in Canada and around the world. For further details, please see newsletter attached. 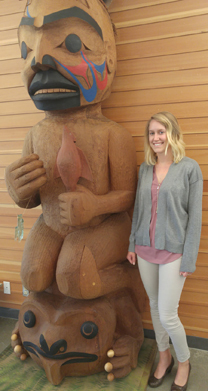 PCU-WHS was fortunate to have been approved for the University to hire a summer student for 2018 under the Federal Government’s Canada Summer Jobs Program. We are most pleased to introduce Cassandra in this short release. IFDM 2018 will build on the history of innovation, leadership and best practice solutions through 78 stimulating workshop sessions and 3 plenary panel presentations with representatives from approx. 20 countries. 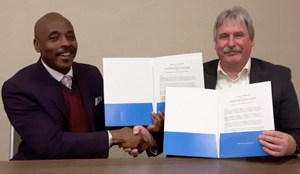 An agreement signed between the Pilon School of Business at Sheridan College and Pacific Coast University for Workplace Health Sciences (PCU-WHS) allows students who have completed the diploma program in Human Resources to transfer their credits from Sheridan towards the Bachelor of Disability Management at PCU-WHS. The Bachelor of Disability Management is the first – and only – degree of this nature and level internationally. It provides graduates with the underpinning of knowledge, skills and competencies to assist absent workers to return to work and employing organizations to promote and protect the health of workers. 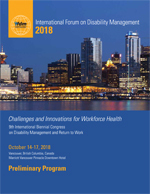 The Honourable Wayne G. Wouters, PC OC, Founding Chancellor of Pacific Coast University for Workplace Health Sciences (PCU-WHS), has provided an invitational and welcoming video to attend IFDM 2018 – and he identifies the challenges of different kinds of disabilities, the changing workplace, the importance of return to work, and the opportunity to learn from each other and to share best practices from around the world. 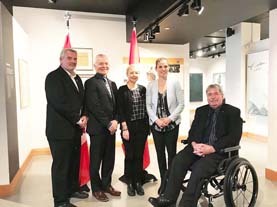 The Honourable Kirsty Duncan, Canada’s Minister of Science and Minister of Sport and Persons with Disabilities, announced funding for the International Forum on Disability Management – IFDM 2018 – through the Disability Component of the Social Development Partnerships Program, at a news event held April 12 in Victoria. 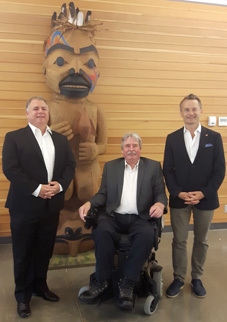 Also attending the event was BC’s Minister for Indigenous Relations and Reconciliation, the Honourable Scott Fraser who is MLA, Mid Island-Pacific Rim, in the riding where the Pacific Coast University for Workplace Health Sciences (PCU-WHS) and NIDMAR are located. To view the news release, please click on the link below.